It seems like winter just doesn’t want to let go this year. Here we are in mid-March, with St Patrick’s Day looming, and the temperatures are set to plunge below zero again. The only sensible course of action is to hunker down indoors, with the fire lit if you have one, and crack open some seriously strong stouts. I chose three such to taste test. The first was Midnight Celebration Stout by Kew Brewery (330ml bottle, 7.5% ABV). Next was Hazelnut and Cacao Imperial Stout by North Brewing Co x de Molen (330ml can, 10%). And finally there was 3 Bean Stout by Lervig (330ml bottle, 13%). That’ll put hairs on your chest. 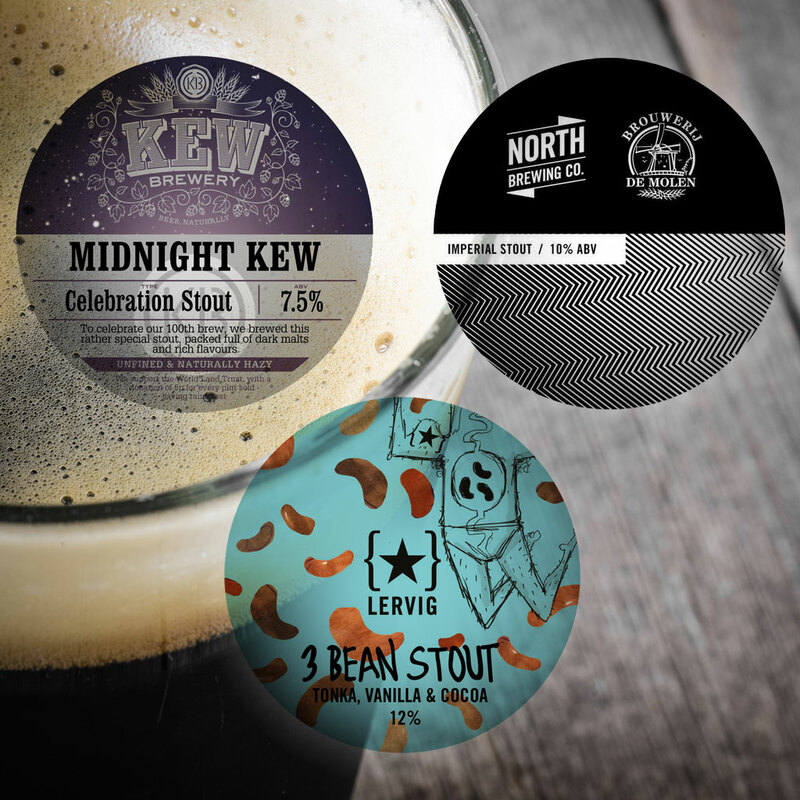 The Midnight Kew Celebration Stout is an oatmeal stout brewed with treacle and local honey. The celebration part is because this marks Kew’s 100th full-scale brew. It’s gently decadent, rich and fruity, tasting of berries with coffee and chocolate. It has a lightish body for something this strong and slips down easily leaving a sherry-like aftertaste. Slightly sticky lips and a touch of warmth on the tongue are the only hints that this is north of 7%. It pours super dark garnet appearing inky black in the glass, with a creamy light tan head. Its aroma starts with chocolate and coffee. There’s a little boozy dried-fruit note with red fruit behind that. Finally there’s a touch of something vinous on the end. The flavour is smoothly roasty and a little bit fruity but subdued, and there’s that vinous note again. Fruity coffee, red fruit, dried fruit, vinous booze, and a warming and coffee finish. The North Brewing Co Hazelnut and Cacao Imperial Stout is earthy and roasty, then fruity as you like with a bright coffee bean flavour. It’s surprisingly light in fact and gentler than you might expect from an impy stout. There’s a gently warming boozy kick but this doesn’t taste like it’s going to knock you over. Which is might, at 10%. Don’t say I didn’t warn you. It pours dark black, with a rich and thick dark tan head that sticks around a pleasingly long time. Its aroma is fairly gentle, smelling earthy and malty with coffee notes; fruity coffee and maybe a faint boozy edge. The flavour is quite rich, with hazelnut, vanilla and coffee, and again that boozy hit. The bitterness is kept low but there is a touch on the finish, along with a lingering fruity coffee note and some alcohol warmth. The Lervig 3 Bean Stout is a huge beer. This is real sticky-lips territory. The tonka beans dominate, allowing just a touch of cocoa to show through – reminiscent of the powdered cocoa used for baking more than anything else. This beer is smooth and full, richly warming, and a little bit exotic like a spiced hug. There is some fruitiness there, dates and red fruits, redcurrant perhaps. Again the colour is super dark, with a light tan head that is slow to come up and dissipates fairly quickly too. The aroma is coffee, vanilla, and tonka tonka tonka. The flavour is rich and smooth; huge tonka and vanilla but not much chocolate or coffee, although there is a bit of a roasty aftertaste. Either one of these big beers should do a very good job seeing you through the last bite of winter weather, and keep you warm until it’s time to emerge at last into the spring sunshine that must surely be just around the corner.